Raising salaries can be difficult when budgets are tight. But replacing a key person could cost you about two times their annual compensation! The good news: Pay is only one factor in retaining great talent. This guide shares the latest retention techniques recommended by employee retention experts Beverly Kaye and Sharon Jordan-Evans. Gleaned from their bestselling book, Love ’Em or Lose ’Em (with over 700,000 copies sold! 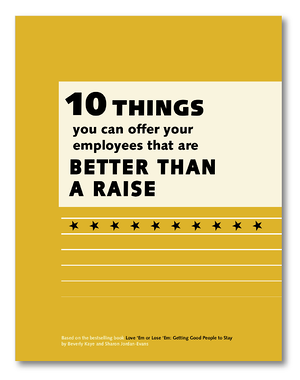 ), this guide will help you figure out what you can offer your employees that is just as good as—or even better than—a raise. Download this free resource from Berrett-Koehler Publishers today.